It may seem contradictory for a self-proclaimed optimist to quote Walker’s counsel to expect nothing, but there is very real difference between expectation and optimism. Admittedly, optimism involves some expectation, but it is mostly of a general sort. We expect that joy lies ahead if we are willing to cooperate by actively seeking for good. We expect that our faith will eventually be proven as well-founded. Beyond that, though, it’s a bit fuzzy. If we expect a new car, a palatial home or always a little bit more than we currently have, optimism is crowded out by a feeling of entitlement. If we give our love with expectation of commensurate return, that’s a risky proposition at best. If we serve with the expectation of gratitude, our service will be more likely to taint our relationships with selfishness. I’ve found that the most delightful gifts are those that are wholly unexpected. The snapdragons pictured above have become one of my favorite plants, primarily because they have come back again every year without my expecting it. When I bought that particular plant years ago, I was told it was an annual. I planted one or two six packs of tiny seedlings and figured I would enjoy them for a year at most. The next year, two of them came back, a yellow one and this pink one. The yellow plant has barely hung on, flowering sparsely in recent years, but the pink one gets bigger, blooms earlier and lasts longer each year. Every year they come back, I count it an unexpected gift. There’s no more frugal surprise than a volunteer plant that returns to decorate our lives without added expense or effort. Living frugally is its own reward, and as Walker affirms in her lovely poem linked above, the frugal life is full of charming surprises. what a bright happy gift they are each year when they return with a smile! Yes, I hope we eventually have a lot of them! Oh it hurts so much when you expect and nothing happens. SO, I really agree with you. Live life without any expectations. It’s hard for me to avoid, but I do try to temper my expectations by broadening them to include a fairly wide range of what I hope for. You’re right, it hurts terribly to be disappointed, but I suppose this is part of the way we learn to minimize what we feel entitled to have. Thanks for visiting! Good early morning and jump start to a wonderful week, Julia. I had a similar delight on our picnic table Friday, just waiting to greet me. It seemed a lone pink petunia wanted to be more than annual, too. I’ve had flowers that appeared in unlikely pots or beds over the years. I fondly call them “hitchhikers” since they came on their own. Sort of like us! Haha. Sheila, my mother always calls them “volunteers” and we have gotten some of our best plants that way. We had a wonderful cherry tomato spring up in one of our flower beds – it got HUGE and we got a ton of tomatoes from it and never knew where the seed for it came from (a bird I’m sure). We also had a plant spring up by our mailbox that turned out to be a lovely crape myrtle, replanted and now over 6 feet tall with lovely purple-pink flowers! I just love petunias, and sometimes we have them “come back” although I never know whether these are the same plants, or just re-seeded. I’ll take them either way! I have felt that the happiness we derive from the wishes granted is short-lived. But unexpected gifts satisfy us and we feel more grateful. Have never seen such flowers. Your collection is amazing. Thanks, Bindu. I have been searching for some snapdragon seedlings to plant more of them, but have not been able to find any this year, even at plant nurseries. I am puzzled by this since they are so pretty and obviously grow well here. I wish I could send you some! Hope you are doing well. There is a Buddhist expression that may relate, “Abandon all hope of fruition,” attributed to Ripanche Trungpe. When we expect nothing- we are somehow free to live in the moment and to act with impunity. It is like the person who said,” My expectations of myself were so low that I was so surprised when I achieved a modicum of success.” I am not sure that fits-but when we separate results from action it can be freeing. It is like when I go fishing- I always have a wonderful time-regardless of whether or not I catch a thing. And many times I get nothing. Not sure that relates. Mike, I think it does relate. For years my father hunted deer with a primitive bow, and while he insisted on hunting only for food (eating every part of the animals he killed) most often he would hunt without killing anything and seemed to enjoy this as much as when he did get a buck. Some of his seemingly favorite stories are of seeing deer that he does not shoot or even try to shoot. Most of the hunters I know talk mainly about the joy they get from walking around in the woods, even sleeping there, sometimes without tents or anything. I do think expectations often set us up for disappointment. I have heard or read that the bronze medal winners in the Olympics are generally happier than the silver medalists, and I think that make sense. Silver winners often think of having missed the gold, but maybe the bronze winners were not expecting any medals. Snapdragons would never over winter here. I did plant some miniature sunflowers which are a lot of fun and only grow about two feet high, with regular size flower heads. Some of the Poppies also reseeded in my garden. A surprise. I wish we could grow poppies here. I love the big colorful ones. I used to easily grow the California poppy while we lived there, which is pretty much a wildflower, I think, so it’s not hard to grow. I also wish I could grow peonies. I have some that have beautiful foliage but I’ve never had too many flowers from them. Maybe they don’t get enough sun. I would think Seattle is a generally good area for gardening because of the rains. For some reason I don’t think of it as being a cold place but I guess it is. The flowers are beautiful. Thank you for the up date on Jeff. I hope that he is healing and feeling better each day. Sounds great about us getting together sometime after Jeff is back in tip top shape. Love to all. Thanks Carolyn, we will definitely have to plan a “survivor’s reunion” in a few years! Thinking of you and praying you will continue to do well. Great post, thanks for the link! I have often tried to convince people that so-called “sacrificial” giving is painless and joyous. I’m not talking about going hungry or without a place to live, but giving up the extras that we have come to think of as necessities (new cars, fancy clothes, jewelry, any status object…) Living frugally is truly its own reward, immensely freeing, not least because it makes giving much more possible. It sounds so hard to believe, but it’s really true! Thank you Rene. The sad post script is that this past winter finally appears to have killed off that gorgeous snapdragon – it shows no traces of reappearing (yet) but it was certainly delightful to enjoy it all those years. Now I’ll be hunting for some new ones…I’m not sure why, but I seldom see them among the much more easily-found petunias, impatiens, pansies and dianthus. In any case, I’m glad I captured that lovely plant in a post, while it was still in our lives! They are so beautifully intricate to be such small flowers. 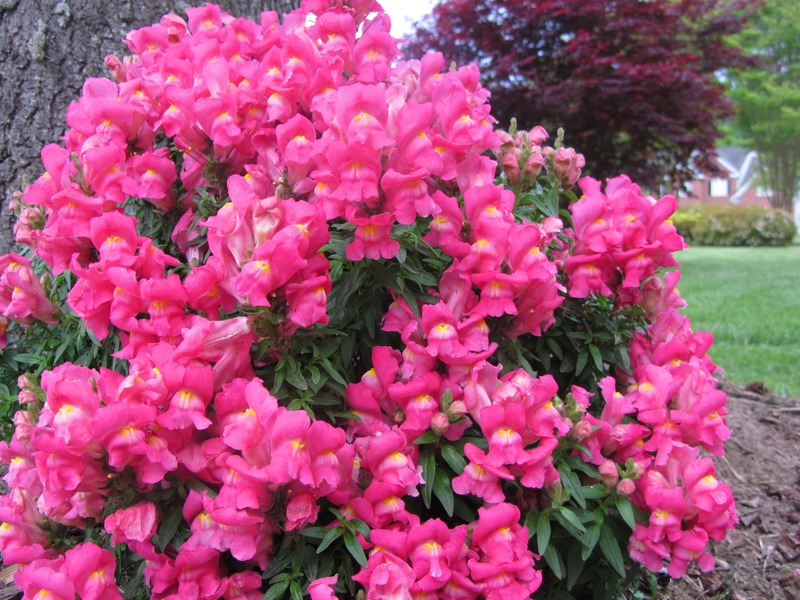 When I was very young, my Daddy showed me how to take a snapdragon blossom and use it like a puppet. He would “snap” at our fingers and I found the whimsy of it so amusing. I don’t know whether that’s really where the snapdragon gets its name, but to a little kid, it surely was fun. Perhaps that’s why I find the snap so delightful today. Thank you, I appreciate your visiting here!